Hello terrible photo quality! I can not believe that it’s the 30th of September already! The only good thing about this month flying by is that it means tomorrow is October and October = Halloween! Please tell me everyone else is as excited as I am? 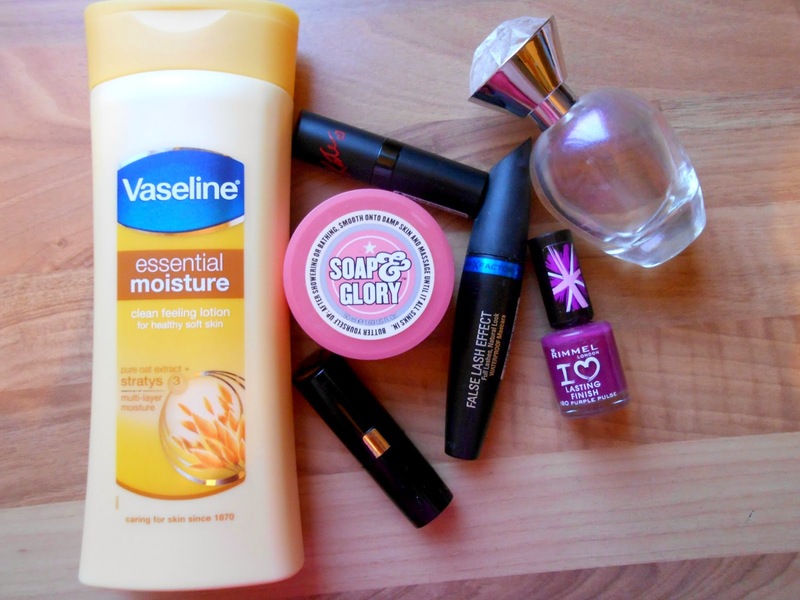 The first thing in my beauty favourites this month is the Vaseline Essential Moisture (The only link I could find was Iceland but I know boots and Morrisons also sell this in both 200ml and 400ml!) Clean Feeling Lotion. This one in particular has pure oat extracts and it smells so refreshing! I think the 400ml bottle cost me about £3.50 which is nothing for the amount of product you get. The lotion is absorbed rather quickly by the skin which is fab because no one likes feeling sticky! The next product is a Soap & Glory one and it’s their Righteous Butter. I picked up this travel sized pot in boots yonks ago after reading great things about it across the blogosphere and only recently tried it out, I wish I hadn’t waited so long because I love it! It is rather heavily scented but I don’t mind that in body butters/lotions as the scent seems to die down after a short while. It’s a mix between rose and grapefruit(thanks Charlene!) and there’s something else in there that I can’t quite put my finger on. It’s shea butter based and also has coconut oil in it so it really does make your skin feel super smooth. I know i’ll deffo be buying a full sized tub next time i’m back in the UK. Boots current retail price for a 300ml tub is £10.50. So of course there are two lip sticks in this month’s favourites! I featured Rimmel’s Lasting Finish by Kate in the shade #03 in my top 5 drug store lipstick’s post and honestly, it could be in my favourites every month. It’s such a subtle colour that goes with any make up look. It has a super creamy texture, which I love, that glides on to the lips with minimal effort. The other, is one of Collection’s lipstick’s from their Gothic Glam range, #03 Revenge. This is the perfect, bold lip colour for autumn. A vibrant red with just enough purple to deem it plumy but not too dark. I’ve found that you can also apply this colour lightly with a brush for a more subtly shade, For £2.99, you really can’t go wrong. Next up, another item i’ve had in my make up bag for a while but haven’t really got round to trying it out yet. The Max Factor False Lash Effect in Black Brown claims to give you full lashes, a natural look and be waterproof. It really does do all those things! Due to the colour not being so intense(black) it really does give more of a natural look. Most mascaras have that scary little word waterproof plastered across their packaging and this bad boy really is waterproof. My eyes water a lot in the winter so this is going to be perfect! You can grab this from boots for £10.99. The nail polish in this post is an old one from Rimmel’s I Love Lasting Finish line. Unfortunately this shade, Purple Pulse, is no longer available. I think I bought this around 4 years ago and i’ve used it a couple of times but this month I found myself reaching it for it more often. In fact, i’ve got it on right now! It’s a lovely, rich plum shade that’s vibrant and has a good 3-4 day no chipping wear. I’ve acquired a rather large amount of the lasting finish polish’s from Rimmel and I’d highly recommend them to everyone! They have a really vast range of shades and i’m never disappointed! Last but not least we have the perfume i’ve been wearing for the past two months. It’s one from Avon and it’s called “Rare Diamonds.” Now, if you’ve ever smelt this in store or straight from the bottle and didn’t like it, you need to try it out again. I find that when it’s freshly sprayed, it’s rather overpowering and heavily floral, but after around five minutes of it being in contact with my skin it smells so fresh and fragrant, not too strong, just the right level of scent that I like from a perfume. Now, I know perfume smells different on each person, but if you thought it smelt gross when you first smelt it, try again and give it some time. I promise this isn’t a sponsored item haha! So there we have it, my monthly beauty favourites! What were yours this month? Let me know! If you’ve done a whole blog post too, leave your link below and i’ll have a gander!